Photos of the 2016 Presidential $1 Coins featuring Nixon and Ford. The Reagan $1 design will be unveiled Feb. 6. The United States Mint has trimmed prices on eight annually issued collector sets. The sets are varied in makeup, ranging from coins in qualities of proof and uncirculated to coins composed in clad and silver. What they do have in common are Presidential dollars, and that’s why their prices are lower than last year. 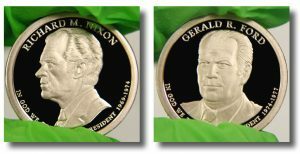 Coins of former presidents have been issued at the rate of four per year since the dollar series kicked off in 2007. The series ends this year with only three presidents left to commemorate — Richard M. Nixon, Gerald Ford and Ronald Reagan. The Mint’s new pricing exactly reflects the reduced number of dollars in each set. The new pricing information comes via a document dated Jan. 13, 2015 and published Wedneday in the Federal Register, the official source of notices by government agencies and a daily journal of their proceedings. WOW!! They reduced it dollar for dollar! Unc. dollars sell for over $3 each and proofs go for over $4.50 each. Shouldn’t the discount match those prices?? Also… Silver and gold have almost hit bottom. Will the mint wait until the end of the year to reflect this decline in their silver coin/set offerings, after most sets have sold?? I guess now we know how much packaging really costs for each of these coin sets. Just like big business, you waste no time inflating prices to keep ahead of the market. When prices fall they take a very long time dropping prices. Less collectors, lower sales, very costly to keep up with collection, you wonder when the us mint will wake up and realize they will sell more and make more at lower prices that reflect market pricing for precious metals than high prices and lower sales. Any collector would buy more than one or a different set if they didn’t have to mortgage their house to afford over inflated coins from the mint. Hmmmm…Me thinks we are not a bunch of “Happy Campers” here United States Mint. Pay attention. Those “Reductions” are truly insulting to say the least. Could be worse though…just check out the prices from the Canadian Mint. OUCH!!!! Couldn’t help but notice the $100 liberty gold was exactly $50 more than the $50 buffalo. They just slap a face value on it then collect the real difference from us. Buying 1 oz of gold in each but paying $50 more for the anorexic liberty coin? The buffalo aside from the price is a much more attractive and historic coin way more worth buying than the anorexic liberty, even without all the scratches, etc. Less packaging, less price, especially on the annual sets. Mint set, especially, should be priced for beginner collectors. The law that authorized the minting of the HR Liberty was only for a Gold mintage and never included language for a silver mintage. The mintage of coins are authorized from laws that are written by our state elected officials. The Mint has some flexibility but must produce to the written requirements. Not sure if this is the right place for this question, but there seem to be some erudite folks on here that might know. So, here goes: What becomes of the unsold non-bullion proof and mint sets and coins that are in them once sales are discontinued? Are they distributed for sale until sold out at the mint gift shops? Are they put into circulation? Are they stored in a vault somewhere? With the exception of the nickel alloy, it seems that you wouldn’t melt cents, dimes, quarters, halves, or dollars because of the expense involved in reformulating and recasting their special alloy and lamination properties. So where do unsold set coins go? Thanks. I placed my order ASAP on 4-6-17 for the 2017 W Am Liberty Gold Coin from the US Mint. I am STILL WAITING FOR IT TO BE SHIPPED. The BIG BUSINESS OWNERS HAVE RECEIVED THEIRS. You could say that I am PISSED-OFF. Just like when the SILVER MEDAL came out last year, I ordered asap when it was available, BIG BUSINESS ALWAYS COMES 1st. The US Mint DOES NOT DO FIRST COME FIRST SERVE!!! Sure, I can get the cheap stuff right away. But if you are the little guy GOOD LUCK. I usually need to wait for the US Mint to make more of the so called “SPECIAL” gold or silver coins. Tell me, is this the way the US Mint should work? I THINK NOT!